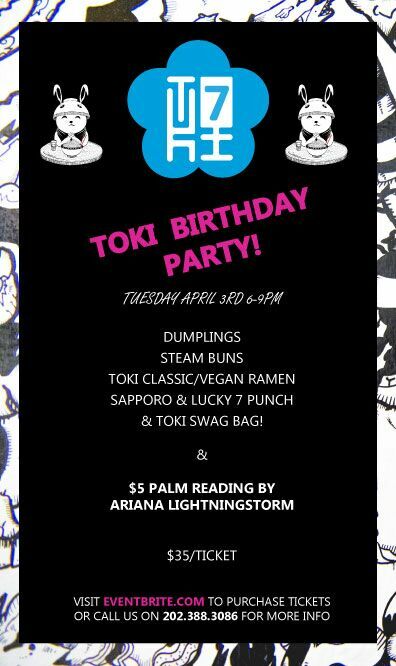 Toki Underground, DC’s first Ramen house, is turning 7 years old in April and to celebrate this lucky birthday, Toki will host a celebration of hour long parties featuring its signature dishes, a fortune teller and alcoholic beverages for guests on Tuesday, April 3rd, starting at 6:00 p.m. Seven symbolizes luck and togetherness in many cultures and shows up in astrological and religious concepts from different countries and civilizations. Tickets for each slot are $35 and guests are invited to the restaurant in one hour blocks to enjoy pork and vegetarian dumplings, fried chicken and cauliflower steamed buns, and mini Toki classic ramen or Toki’s new vegan ramen. Guests can also enjoy Sapporo beer and 'Lucky 7 Toki punch'. Ariana Lightningstorm, a local DC palm reader, will be offering $5 palm readings and each guest will be gifted a parting swag bag. Toki Underground is located at 1234 H St NE. An event flier is available here.